A fire swallowed the nation's No. 1 treasure Sungnyemun - more commonly known as Namdaemun, meaning South Gate in Korean - in the heart of Seoul late Sunday. 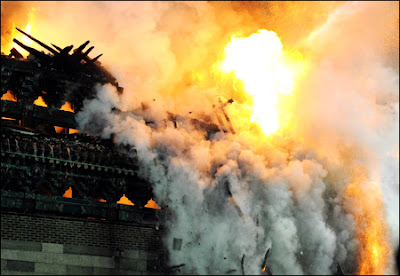 The historic structure from the Joseon Kingdom was totally demolished four hours after it caught fire at 8:30 p.m. Firefighters stopped operation at 10: 30 p.m. as the blaze appeared to be extinguished but it flared up again some minutes later, spreading quickly beyond control. About 30 fire trucks along with 90 firefighters rushed to the scene to bring the blaze under control. There were no reports of any casualties and the exact cause of the fire has yet to be determined, they said. Police suspect someone deliberately started the fire as a taxi driver, identified only by his surname Lee, said he saw a man in his 50s go up the stairs of the gate with a shopping bag, while he was waiting to pick up a customer in the nearby area. Lee said he then saw a spark like a firework and reported it to police, adding the man came down the stairs afterwards. The taxi driver said he drove around looking for the man but could not find him.